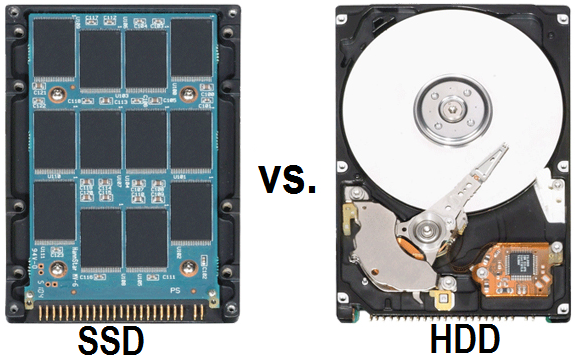 Solid-State Drives (SSD) vs. Hard Disk Drives (HDD): Which is Best for PCs / Laptops? Storage devices are manufactured differently. This reflects their equally different uses and devices that run on them. Recently, however, solid-state drives (SSDs) have rapidly made their way into the market especially because of their improved storage capacities. The prices of SSDs are also falling steadily. To appreciate this, people are gradually shifting from traditional hard disk drives (HDDs) to SSDs. This provokes the question: what is the difference between SSDs and HDDs and is the upgrade worth it? Below are key factors to consider before making the SSD vs HDD decision. Following is the Difference and Comparison Review between Hard Disk Drives vs. Solid-State Drives Features. SSD vs. HDD: Is It Worth The Upgrade? SSDs are superior to HDDs in all system operations associated with speed. Systems running on SSDs will boot in seconds. Sometimes PCs with HDDs and low processing power can take a minute or more to boot. SSD speed is constant and is not affected by the operating system you are running or the tasks being executed by your PC / Laptop running Windows or Mac. SSDs are faster than HDDs in booting, loading apps, and transferring data to both internal and external storage devices. Even corporates and institutions are embracing SSDs in recognition of their impressive speeds. They are slowly switching to SSD servers. Since the read/write speeds of SSD are superior to those of HDDs, servers powered by the former will deliver web pages to the client side much faster. This will lead to a tremendous improvement in user experience. HDDs rely on heads that read and write data on the magnetic disk surface. To achieve this, the disk has to spin, and the head has to move back and forth. This makes HDDs mechanically fragile because any slight impact puts the internal components at risk of damage. A seemingly slight fall can ruin a HDD. SSD don’t have any moving parts. The flash memory chips are firmly wired onto the motherboard or PCIe slots. Dropping or treating an SSD roughly bears minimal risk in terms of damage. SSDs thus become the ideal storage devices for laptops because this type of computer is highly portable and is regularly carried around. Sustaining the spinning disk platter and moving parts in HDDs requires power. Over the years, HDD manufacturers have made significant strides in making power consumption more efficient. Despite these efforts, SSDs consume a third of the power used by HDDs because the former has no moving parts. Nothing in an SSD rotates or moves. While power considerations are negligible with desktops, it’s not the case with laptops. Big firms may use hundreds of laptops and require their staff to move around often. Where electricity bill is an issue, the preferred drives are those that consume less power. The initial HDDs made a lot of noise when running, but manufactures are making relatively quiet drives today. Due to the internal moving parts in a HDD, it is not possible to eliminate noise entirely. They vibrate while the platter spins, and this may result to a slow hum. SSDs are completely silent because they lack moving parts. Every year, manufacturers step up the storage capacities of HDDs. Today, a desktop running on a 3.5” 6 terabyte (TB) Hard Disk is not uncommon. Such a disk goes for about $312, and this should be affordable to many. A 2TB, 2.5” HDD costs about $156. Unfortunately, SSDs don’t have such an attractive offering in terms of GB per dollar. A 1TB, 2.5” SSD costs as much as $486. As technology advances, the prices of SSDs are gradually coming down and it’s possible to encounter a 4TB 2.5” SSD sooner than a similar HDD of the same capacity and form factor. If you’re on a budget, HDD is you best choice for now. HDDs are prone to fragmentation. In fact, they work best if they can write large amounts of data in contiguous blocks. However, as the disk fills up, data is written inconsistently-at different sectors on the disk platter. The result is fragmentation, an occurrence that can slow down a computer system’s read times because the heads needs to locate the relevant blocks when reading data. The absence of read heads on SSDs makes them inherently faster than HDDs because it doesn’t matter where the data is physically located on the former. Although most SSDs are made in the same standard sizes as those built for HDDs (3.5” for desktops and 2.5” for laptops), the fact that the former lack rotating disks means that their chips can be modelled into any shape or size. They can be made flexible enough to fit any computer chassis and this makes a big difference in a world where manufacturers are fighting to outdo each other in making ultrathin Laptops. SSDs are also lighter than HDDs, making them the more attractive option. Who wins in the SSD vs HDD war? If you’re on a budget, or in the multimedia industry and require vast storage space, HDDs are your best option. Despite the fact that it falls short of the SSD in terms of speed, size, noise, and durability, you won’t even consider these shortcomings when your system is running on a 6TB HDD. If convenience, performance, and durability are in question, the SSD erases all those concerns. Very soon, SSDs will catch up with HDDs in terms of cost and storage capacities. Thus, an investment in SSD Macs or PCs will be worthwhile in the end.